Excerpt from U.S. Coast Guard “Proceedings of the Marine Safety & Security Council” magazine by Captain Anthony (Tony) Regalbuto (USCG, Retired), Chief, Office of International and Domestic Assessments. The U.S. Coast Guard has a proud tradition of collaborating with our partners throughout our long history. The September 11, 2001 terrorist attacks required that we build upon these relationships since addressing these new threats exceeded the capability of any one agency. The U.S. Coast Guard brings some unique competencies to the playing field when it comes to collaboration. We like to call ourselves “governmentally bilingual”—we speak the language of the Department of Defense (DoD) as well as the language of the civilian agencies. We also serve to bridge relationships among DoD forces and non-DoD agencies such as Customs and Border Protection and the Federal Emergency Management Agency. The U.S. Coast Guard also has bilateral relationships with coast guards and navies around the world. 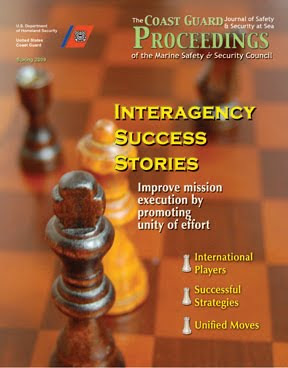 In this next set of blogs excerpted from the Spring 2009 issue of Proceedings, we will share our successes in building international partnerships, outline accomplishments on the home front, and illustrate joint training and joint operational efforts. We will cover organizational efforts and illustrate these “best laid plans” with accounts of how they played out strategically and operationally. I would like to thank this issue’s authors, many of whom took on their assignments while participating in activities and operations far from the comfort of a cubicle. As we are challenged by old and new threats, we will continually learn how to build upon our common interests and cooperate in interesting and innovative ways.